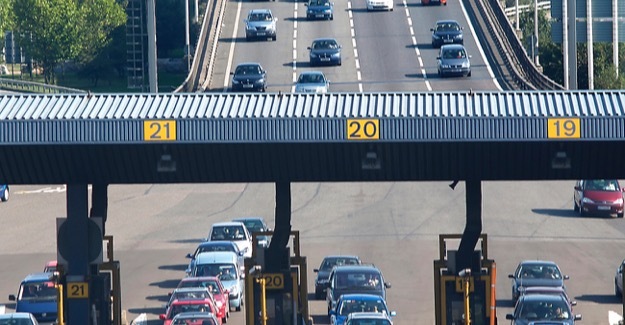 From Sunday the toll booths at the Dartford crossings will be removed and drivers will have to pay online or by phone. Use of the two northbound tunnels and the southbound QEII Bridge will be monitored by ANPR cameras. The change is part of efforts to reduce traffic jams at one of the most congested parts of the motorway network. But at the same time the charge for a single car crossing will rise from £2 to £2.50. This is after a previous rise from £1.50 to £2 in October 2012. Already the government is consulting on where a new lower Thames crossing should go. “The crossing is the motorway bottleneck of Europe and routinely sees traffic volumes way above the maximum design capacity. “We welcome the changes but they are not coming cheap. Charges are being hiked and car drivers will pay a quarter more for the privilege of faster journeys. At the same time operating costs will be about three times what they were when the booths were there. However the benefits in quicker journeys are predicted to be huge.